The rustic allure and ornamental symmetry of the ancient pomegranate has long inspired the passions of artists, poets and writers alike. Originating in Iran and cultivated throughout the Middle East and the Mediterranean, it was the Spanish who first carried the pomegranate to California where most are grown. Beginning in early August, workers hand-pick the ripe, ready-to-eat pomegranates from small, flowering, shrub-like trees. The season continues through the middle of November, but they are shipped to market through the end of December, making them an ideal addition to holiday menus. The color of a pomegranate can vary from light red to deep purplish-red. The skin is tough and leathery, but don’t let that fool you. The abundant, edible seeds with a sweet-tart juice are also called arils. Clustered together, they are tucked inside a white membrane that runs throughout the fruit. Pomegranates are ready to eat when purchased; they should feel heavy for their size and the skin should be brightly-colored and blemish-free. Once purchased, pomegranates keep well at room temperature for several days. For longer storage, refrigerate up to two months. Pomegranate seeds add versatility and flavor to recipes. They’re especially popular in Mediterranean dishes. Try them as a garnish for appetizers, soups, roasted meats, salads and desserts. Sprinkle over yogurt, cottage cheese and fruit salad or enjoy atop ice cream, frozen yogurt and sorbet. Pomegranates boast vitamin C, potassium and antioxidants, making them a popular fruit among health-conscious consumers. Pomegranate juice is quickly gaining popularity for its great taste and health benefits, rivaling green tea and red wine for its cell-protecting, antioxidant power. The juice is great on its own or blended with sparkling water, fruit juice or green and herbal teas. Come party time, it makes an ideal substitute for red wine, providing many of the same health benefits without the alcohol. That’s good news for a happy, healthy holiday. 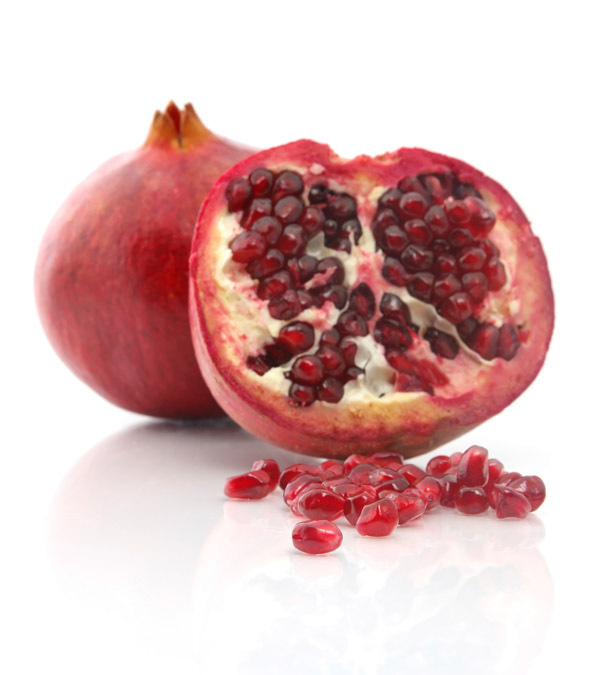 Pomegranate seeds, also known as arils, are loaded with antioxidants and make a colorful addition to many meals. Removing the seeds from the pomegranate is going to require patience and a soft touch. Note that the juice causes stains, so protect your clothing with an apron. Start by cutting off the crown of the pomegranate. Score the skin into sections, cutting where the membrane is thickest. This will minimize damage to the seeds. Submerge the pomegranate in a bowl of cold water, gently prying it into sections to open up the membranes. Still working underwater, remove the internal membranes, and then gently and carefully push out the seeds. The seeds will sink to the bottom of the bowl and the bitter white membranes will float to the surface. Discard the pieces of skin and skim off the floating membranes, leaving only the seeds behind. Pour the water with the seeds through a mesh strainer to drain. Transfer seeds to a paper towel to dry. A medium pomegranate should yield about 3/4 cup of seeds. The seeds can be refrigerated in an airtight container up to three days and frozen up to three months.